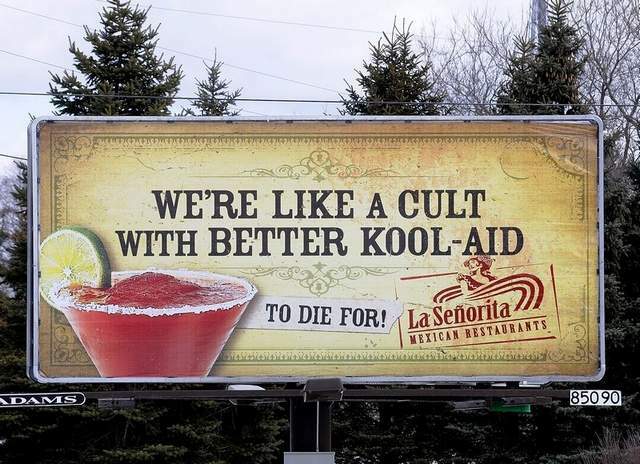 A billboard in the Lansing Michigan area for La Senorita Mexican Restaurants has caught some heat for its headline which alludes to the 1978 Jonestown mass suicide. The headline reads, "We're like a cult with better Kool-Aid" and the sub-head, "To die for." In an email to the Lansing State Journal, La Señorita Mexican Restaurants VP of Sales and Marketing Jeff Leslie wrote, "We have received some complaints. We use humor in our ads to communicate the positioning of our brand, and there's always a risk with humor that you might hit a nerve. This one has. So, while we know that not everyone will get the humor of our ads and we accept that, we do not expect that our ads will offend people." No. No one ever intends to offend. They just don't think things through before they open their mouths...er...erect a billboard.